or just add a little character to them? 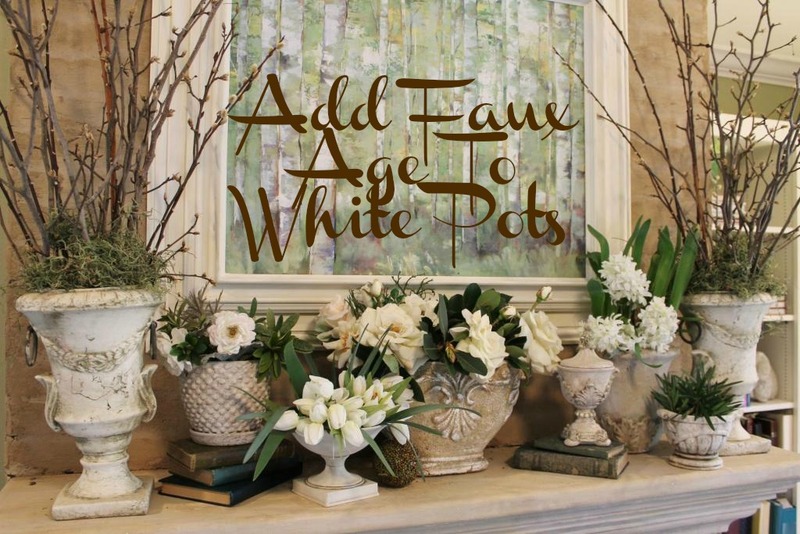 unify the colors of some white pots and vases for a mantle. Kirklands a few years ago. That's a "for real" crack in this one...adds some age, huh? plastic, one was glass, one was plaster. ...the others cost $2 each at the most. down paint on the high points to lighten it up a little. The hobnail glass vase was once kind of a purple color. crackle finish applied to it. about "weather" gives you a larger crackle than normal. The crackling does better in low humidity too. and then adding an off-white craft paint on top of it. the watered-down brown paint added too later. her techniques, I had purchased some gesso. Notice the words "economy" and "clearance"? My gesso doesn't act anything like Rosemary's gesso. my bargain was such a bargain. but this time I was adding some plaster to it to beef it up. in a bowl and then painted onto the plastic footed urn. It wasn't too thick and stuck on the piece really well. It also added some texture to the plastic. This vase also had the colored gesso/plaster painted on. The craziest thing that I tried to add age was dirt. A page in Annie Sloan's book "Creating The French Look"
rubbing some potting soil into the wet paint and the crevices. it in place of the chalk paint on a couple of the pieces. Regular paint might work just as well, too...don't know. Just paint your color on and immediately add dry potting soil. stuck was the nooks and crannies of the pots' designs. paint brushed on and then wiped off of the high spots. somewhat aged look to them that was just emphasized. cotton cloth to get some of that green toned down. mossy look...I just wanted it to be subtle like the urns. The green "moss" was added to some of the other pieces too. I'm not sure they would hold up to outside weather. come in handy for you some time! if you need that info. Wow! That's amazing! Your mantel looks like you spent a fortune on it. Thanks for sharing. I'm your newest follower.